One of our dreams is to live off the land while here, meaning eating naturally and organically from what the earth has to offer. We have been harvesting everything available to us that we are aware of, dandelions, common plantain and morel mushrooms. But we have yet to begin our garden. Up at this elevation of the mountains, the locals have told us not to plant in the ground until May 10th. Today was the day to begin, and it has particular significance to me. My mom, Jeannine, passed away unexpectedly 25 years ago today. She was only 51. It continues to bring me great sadness, at times more than others. Early this morning was particularly difficult for some reason, as I woke with a start remembering this day; odd to me the way that happens. Anyway, I went outside, everything was silent except for the creek of course, and the sky was filled with stars, glittering and bright. I found great comfort in that. This is a picture of a picture, so not the greatest quality, but I think you can see the joy of her spirit here. I remember the moment this picture was taken like it was yesterday, it was taken while we spent a wonderful weekend together, one weekend before she passed. So what better way to celebrate life than to begin something new. Today, I celebrate the beginning of our garden in her honor. A preliminary step to planting the garden is preparing what I call the "incubator". This is the place you begin plants by seeds, first in the dark and then with a grow light, until they reach a certain height, then they can transplanted into the garden box or field. Mountain Man created our incubator, simple but functional. The light will raise and lower. And it can be surrounded by plastic to keep things warm if it gets too cold in the cellar. Clever creation by my Mountain Man, made with scraps of wood except for the grow light! Today we sowed the seeds for our garden. There are some vegetables, tomatoes for example, that are best begun indoors. So using seed starting soil, we sowed our seeds. Here are the steps we followed, like a recipe, only you have to wait a long time until you get to eat it! First you fill your mini pots with seed starting soil; this includes peat moss to keep the soil loose to allow the roots to grow. Saturate the soil with water, allowing the water to drip through holes in the bottom of the mini pots. We use rain captured water in a very sophisticated rain barrel...a bucket. Then mist the top of the mini pots with water. You will notice that because the soil is so loose and airy, misting the tops will help saturate everything. Now you are ready to plant your seeds. Tamp down the soil with something flat, you see our tool to the right of this picture. Then put a hole in the soil for each seed you will sow. These are my first seeds, organic spinach given to us by our family as we began our adventure. Put the seeds in the holes...one per hole, or per the seed package directions. We will plant things in rotations, meaning after these seeds grow and are transferred into the garden plot, we will begin new seeds. This way, we space out the timing for things being ready to cultivate, and while I have every intention of canning, freezing, drying and everything else-ing I can do to extend the use of our crops, spacing your planting maximized your growing season. It is very exciting to me that this piece of our adventure has begun. Don't you like my labels? We still have a lot of work to do, because we have not plowed our field and we still have a square foot garden box we need to build (we have one done). But we are on our way, and I can't wait to see things begin to sprout! Have you ever planted a garden in memory of someone you love? Live is short, isn't it? 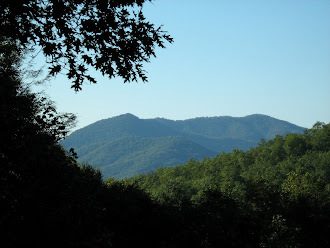 Each morning, when it is warm enough (which means about 53 degrees +/-, and yes I may use a blanket), we sit on the front porch swing, drink our coffee, and watch the sun "walk down our mountain", provided there are no clouds interfering. It is a beautifully refreshing sight - watching the day begin, marvelous and joyful. The birds surround us, singing their songs. The bees begin their jobs of pollinating. The hummers hum. The squirrels steal the birdseed. Our cat Fluffy watches it all. Our dog Pogo waits for crumbs from Johny. And of course, the creek's flow is background for it all. Today I want to share the sun's walk with you. This is the view if you look over the porch swing behind where we sit. You can see the porch swing chain on the right if you look closely. This view is facing east, so the sun is rising above the mountain that is behind us. This is the porch swing with Johny in it (later in the morning, a photo afterthought) but I figured you might want to see the swing too. It takes quite a while for the sun to walk down the mountain, and the perspective from the swing is facing the west wall of the mountain, well, really WSW. I began the photographs when the sun just peaked over enough to begin it's walk. The changes are subtle, but quite mesmerzing. I hope you enjoyed the sun's walk down our mountain today! Today Johny and I attended Sylva's annual spring festival, Greening Up the Mountains, named for the way the greening of the trees creeps up the mountainside during this time of year. It was a very nice event, calm compared to some of the festivals in Florida that we have participated in, and I mean that in a very complementary way. It was a gorgeous day, and though attendance was high, it was not overwhelmingly crowded, leaving room to easily meander along the route and view all the vendors. We parked where the the Sylva Herald suggested, about 1/2 mile away from the festivities. I love that Sylva is surrounded by mountains, and as I got out of the car, was welcomed by a beautiful view. There was a shuttle available to bring people to the event, but we chose to walk. As we walked along the sidewalk, people passing in by their cars waved! Another warm and friendly welcome! When we arrived on Main Street, people were milling about and enjoying the scene. These lovely ladies were manning the Compost/Recycle/Trash tent, where they were collecting people's trash, putting compostable stuff in one bin, trash in another and recyclables in another. The pot below is the compost that was created from last year's event, after a year of mixing and mixing and mixing. Look how rich that compost is! I would have loved to have taken some of that home for our garden! Of course, a festival of this sort can not be experienced without funnel cake...Johny (my Mountain Man) really enjoyed it! We stopped by the Heinzelmännchen Brewery, celebrating it's 8th Anniversary. They have fantastic beers brewed locally! Good stuff! As we were leaving, we watched as a young girl was wooed by a lovely miniature horse, and was guided by it's owner to kiss it's nose. For me, the entire exchange seemed to embody what small town festivals like this one are all about! It was relaxing fun, and we are glad we attended! As you can see, the mountain we are on is still "greening up". We see new green every day, and soon, our mountain will be covered with a velvety green blanket that will surround us. It is comforting. It is protective. It is green! ...our property that is. They are part of what makes this place what it is. From the North to the South, following the East sides of our cabin, we have creeks that flow down the mountain about 15 feet below where the cabin sits. This one flows from SSE, then along the East side of the cabin, joining with the one below and heading North, NNE. The photo does not do this branch justice, because it's beautiful cascades begin further East (further into the photo), I just couldn't capture it all in one picture. I am standing on the bridge to take this photo, which I describe below. The creek below flows from the East, meets with the one above, and jointly they continue to flow North, NNE. This flows inside one of the boundaries of our property, rising up the mountain for several acres. In basic terms, two sides or our cabin are surrounded by these creeks. They are not too wide, 1 - 2 feet in most places, some areas as wide as 3 feet or so, depending upon the terrain and rain, with overflow areas of up to 5 - 8 feet. However, these creeks run despite rain, for they are naturally fed springs from the mountains, and run continuously. Year's ago, these creeks were the source of water for families living up in these mountians. That is not the case any longer, but we do get our drinking water from a mountain fed well! There is a steep decline to them from the cabin, in fact, good protection if there ever was a river flowing instead of the creeks, because we sit far above the danger zone. These are the stairs down from the cabin, or up from the creek, whichever way you choose to approach it! You can see the roof of the cabin in what appears to be the middle of the top of the stairs if you look closely. As you can imagine, we are entertained, day and night, by the mesmerizing sound of the creek's rushing water. Sometimes they are flowing madly, and sometimes they are calmly passing by. But either way, we know they are there. While I love winter and the cold, when the time comes to open the windows, there is nothing more soothing than listening to the creek flow. At night, when I find myself sleepless, I just listen to the creeks, and let them lullaby me to sleep. In addition to the beauty of the creeks, nature offers an abundance of treasures, most often unexpected and lovely little surprises. This little beauty sits on the east side of our bridge, delicately gracing the waters edge. After the heavy rains we had yesterday, along with the past few storms, the creeks are strong and powerful. Tonight is warm enough to leave the windows open more than a smidgen, and I have no doubt the creeks will sweetly sing me to sleep, and keep me sleeping. As I close this evening, I want to thank you for reading my blog. I welcome you to invite your friends to read, follow, subscribe to the email updates, and comment...and I welcome your comments too! I am honored that you all have chosen to share in my journey, and am thrilled that in less than three weeks there is a group of you who are consistently reading and following. I have over 1250 page views to date, and this seems incredible for me. So, with heartfelt gratitude, I THANK YOU!!! For the first time while being here, I felt a little grey early on, a reflection of the beginning of the day I suppose. Not because of being here, but of not being within a two hour drive of my daughters (Erin & Jessi) and grandson (Liam). This is him; he is a sweet soul, full of joy and laughter and an intellegent guy! I miss them. Since the time of Liam's birth 3 1/2 years ago, I have seen him at least every 4 - 6 weeks. But usually, the bug hits me about week 3, and then I make a plan. Working around everything else that is going on, I either travel to them or them to us about every 4 weeks. So I am at that 3 week cusp and I am missing them...deeply. I do plan on heading south in a few more weeks, but it seems so far away! But as the day progressed, and I knew I would be seeing them soon, my melancholy dissipated. But I AM looking forward to those little Liam hugs and time with my girls! I spent the rest of my day enjoying the rain, taking care of things indoors, although I did get my walk to the mailbox! Johny completed the wood rack for our firewood, a big project and well done! Now to chop all the wood we need for the winter to come, another big job! Eventually, this rack will be filled with wood in anticipation of all the fires we will need to warm the cabin in our wood burning stove! Later this evening, the sky broke loose again, with thunder and lightning and hail. Not big enough to cause damage, but it sure made a loud pinging melody on the tin roof! I just love that sound! As I sit here writing, the evening progresses, and we still have rain. And thunder rumbling in the distance, though sometimes getting a little closer, with the rain falling then pelting then falling again. As the rain has ebbed and flowed, the shrouding of the clouds on the mountain view has been mesmerizing; hardly a moment has passed that there isn't a different cloak. I'll leave you with this one, enjoy! We went to highlands today, what a beautiful drive! It is a two-lane road that curves and climbs through the mountains, following a Cullasaja River, with many vistas that are both terrifying and mesmerizing at points. The first amazing site is the powerful, Cullasaja Falls. Unfortunately, Dry Falls was closed to all visitors; this site has a boardwalk that allows you to "get close and personal" so to speak. I will have to share that beauty at another time. However, along the way, there were many other beautiful "no name" spots, this one being a place we have seen many locals swimming in the cool waters in the heat of the summer. We then came to Bridal Veil Falls, a fascinating site because you can actually drive under the rock formation. ...the photo on the left is looking up under the rocks, where the water cascades over the falls...on the right you see the rocks more closely, they are beautiful in-and-of themselves! We walked along Main Street a bit, looking for a place for lunch. Interestingly there weren't many places available, and we smelled the inviting aroma of a grill, so we followed our noses to the Mountain Fresh Grocery...a grocery?...they have lunch?...but yes, inside there was The Grill & Deli. The atmosphere was a little odd at first, being a grocery store with the grill & deli section off to one side of the store. But as we stood around looking at the menu (I believe looking kind of lost) and trying to decide if this is where we wanted to eat, a friendly patron stated that the burgers were the best in town. So, we stayed. And we were very pleased with the delectable burgers and fries. Not the most nutritious, but come on, we've been eating edible wilds almost every day since we got here! As is commonplace in the mountains, people are very friendly and willing to talk about their town, and we (well, really my husband Johny) sparked up conversation with a couple people at the table next to us. This is Bartlet (daughter) and Pat (mother). We talked about this and that; they told us about many spots in Highlands that would be of interest, shared insights about the area, and Pat invited us to go pick Chestnuts from her two trees, (yes, original trees not affected by the blight long ago), in the fall. They were lovely. We headed back toward home, down and around the mountain again, zigging and zagging around the curves. If you ever get the chance, Highlands is a mountain town you just may want to visit!